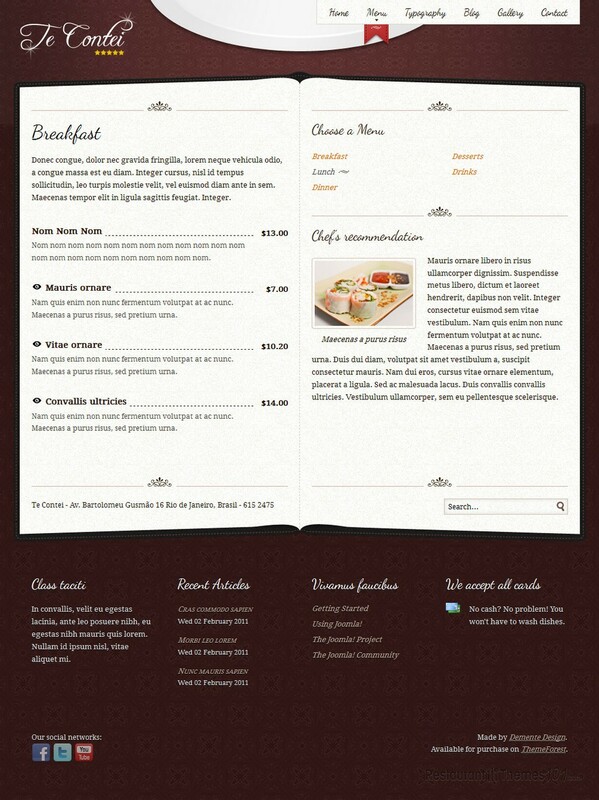 Te Contei is a HTML restaurant template developed by Demente Design and available at ThemeForest. 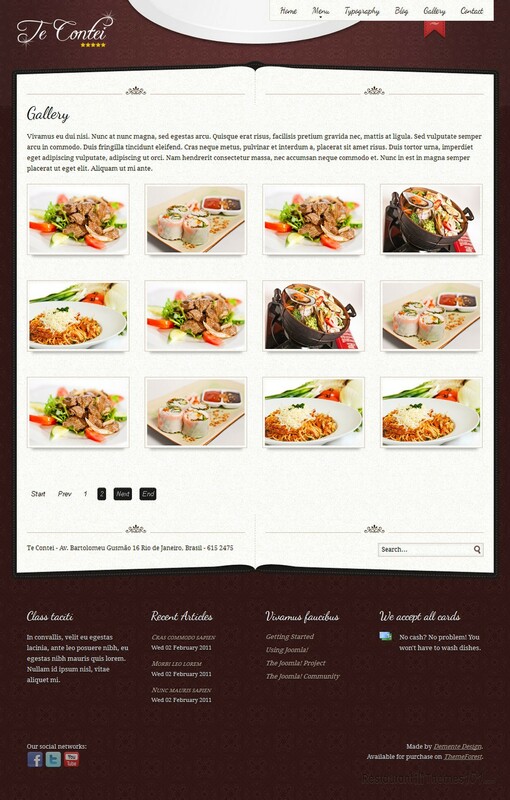 It is a stylish template designed especially for food related websites. The layout of this theme is truly unique. It features a warm brown background with a nice retro pattern and your content will be displayed in a form of an opened book that looks very pretty and stylish. You will be able to add a welcoming note to all of your visitors along with a photo of your restaurant and introduce them to any element of your restaurant, including your cuisine and the fine ambient you provide. You can feature your specialties on your homepage and have photos of them displayed in a slider form, each photo followed by a short teaser text which, after clicking on takes your visitors to a page where you can tell them all about the featured dish, its preparation or even a full recipe if you want to. You will also be able to feature your opening hours on your homepage for everyone to see. This restaurant HTML template also features reservations, parking and many other relevant elements every restaurant website visitor needs to see. The blog section is there for you to post as much as you want and present your restaurant to your visitors as detailed as you want to, through various posts which you can also feature on the homepage. Social integration is nicely done and you will be able to connect your website to Facebook, Twitter and YouTube. 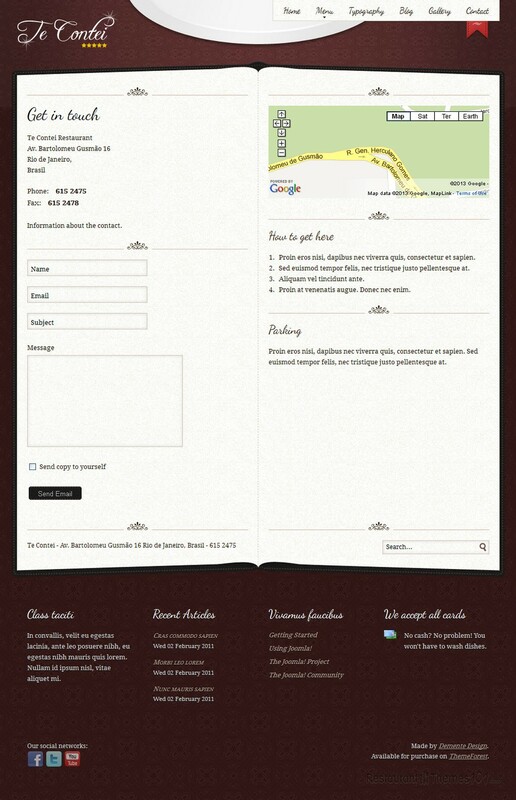 The contact page features Google Maps which enables anyone to get clean directions to your restaurant right there on your website. There is also a simple contact form added for easy and quick interaction with your visitors. This template is both attractive and functional. It comes with a nice amount of documentation and customizing it shouldn’t be a problem, even if you aren’t skilled with codes. 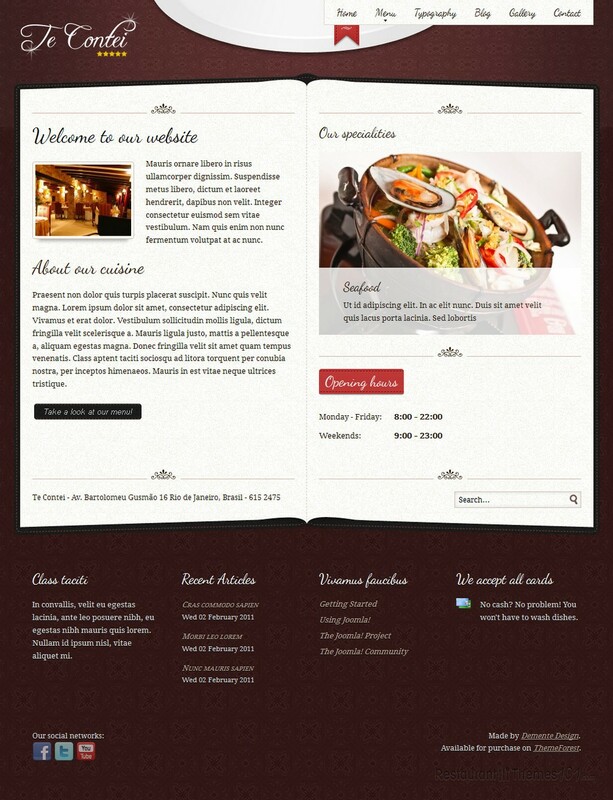 Besides this HTML version you can buy Te Contei also as a Joomla restaurant template.